Since the release of the original EB48 in August of 2012, we have been continually improving our products. Over the years we have tested hundreds of parts, released dozens of meaningful options, and we have improved the overall setup of the EB48. The EB48.2 improved on the original vehicle and has enjoyed incredible success around the world. 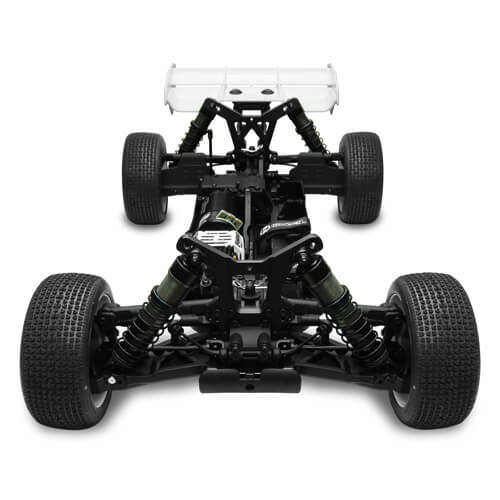 Now it’s time to introduce the EB48.3 – the new standard in the 1/8th Electric Buggy class. We started with the suspension and completely redesigned the geometry. The new design aimed to improve big jump landings while at the same time improve small bump handling and consistency. Longer shocks have been fitted to increase suspension travel and new towers (TKR5268, TKR5269) were designed to optimize shock angles. Revised upper camber link positions on both the front and rear shock tower provide setup options that improve driveability and traction in all conditions. A new piston was designed specifically for the longer shocks (TKR6159) to adjust the compression/rebound characteristics. The lower arms (TKR5184, TKR5286) feature new shock mounting locations. Clamping spring perches (TKR6140) and new shock boots (TKR6144, TKR6145) are included to keep the shocks clean, smooth, and trouble free. We also included the left and right handed shock mounting screws (TKR1240) to ensure you never lose a shock during operation. New rear hubs (TKR5199) allow the option of using the stock CV axles or the upcoming universal driveshafts. We now also offer the rear hubs in aluminum as an option (TKR5199A). At the front of the vehicle are new trailing steering spindles (TKR5193) and spindle carriers (TKR5194). The trailing components vastly improve high speed bump handling in addition to smoothing out the steering response. The vehicle initiates turns more predictably and finishes corners better than ever before. Larger bearings are now fitted to the front spindles for improved durability. The spindles will also accommdate the upcoming universal driveshafts. The V2 hinge pin braces (TKR5161, TKR5162, TKR5163, TKR5164, TKR5165) have found their way into the new kit. They provide more adjustability than ever before. For example, changing the roll centers at the hinge pin is now an easy task and allows you to set up the vehicle for any conditions. Front arm sweep, kickup, rear anti-squat, and rear toe are all adjustable. A revised chassis was designed to increase clearance for the many V2 hinge pin positions. Our low profile wing mount (TKR5181) is included to lower the CG of the whole vehicle. A revised front bumper (TKR5166) increases front ground clearance. Straight camber link rod ends (TKR5187) were produced to improve consistency in corners. Maintenance is easier with the addition of the split center differential mount (TKR5260, TKR5263). 4mm CNC 7075 aluminum hard anodized lightened chassis. Integrated battery tray/mud guard, battery is sunken into chassis for a super low COG. Single pack configuration is better balanced, lighter weight, and makes battery changes easier. Battery tray accommodate 2x2s packs. Angled rear gearbox with large bearings reduces wear. Options for vented cap, emulsion, or standard shock configurations. Adjustable CNC 7075 hinge pin braces are standard. New longer rear sway bar for better consistency. Adjustable Ackerman and bump-steer (bump in, 0 bump, bump out). CNC aluminum Ackerman plate rides on 4 precision bearings. LCG rod ends and lightweight turnbuckles are lowered by 5mm. Front/rear sway bars are the same length = less parts in your toolbox. Easily adjust anti-squat, rear toe, front arm angle, front arm sweep, roll center, toe, camber, wheelbase, rear arm length, Ackerman, bump steer, suspension geometry out of the box. Full set of option parts avaialble. Last edited by Bob Barry; 05-26-2016 at 06:58 AM. Also very important....will there be a new body? The old one is Fugly, I like the LFR style!! No new body. Agreed on the old one and on the LFR. The JC Finnisher and the Proline Phanton are great choices....that stock body is unappealing. I really like the stock NT48 and ET48 bodies and was hoping for an updated EB body from Tekno. Truggy shocks? Or something in between the buggy and truggy length? EB48.3 is available for pre-order now direct from Tekno. 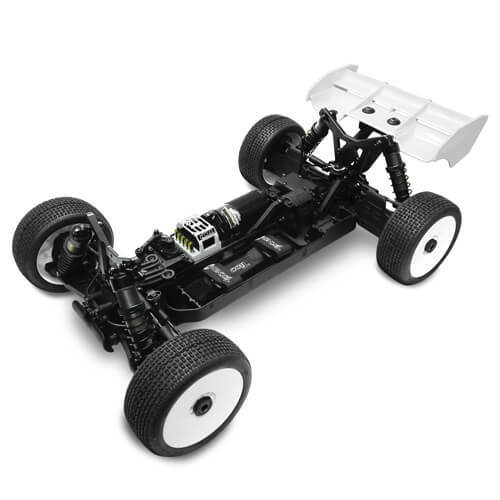 I believe Fierce RC Solutions also has pre-orders up. Other sites/distributors/hobby shops will follow as soon as they can I'm sure. Contact your preferred dealer and inquire for the best possible info. We're hoping to have an initial shipment landing in the 2nd week of July. A lot of spare parts are already here, just waiting for the kits before we set them live on the site. What happened to the original EB48 thread? All youd really ned are the Truggy bodies and shafts. All times are GMT -7. It is currently 09:32 PM.